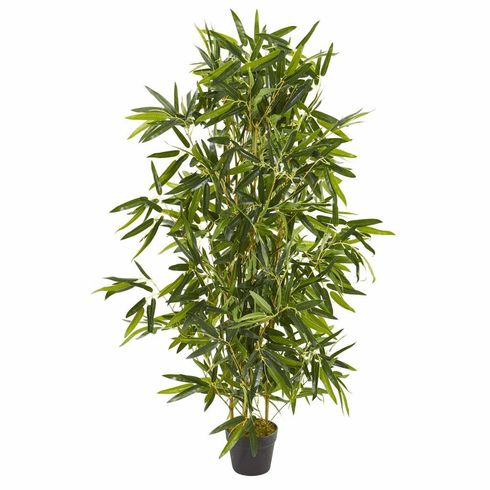 Give your home or office space a zen-like atmosphere with this 4’ artificial bamboo tree. Its numerous amount of real to the touch small green leaves that fill up the multiple stems will last long and require no upkeep. Place it in your bedroom, dining room, or living room to accentuate any mahogany furniture pieces like a coffee table, couch, or sideboard. With its UV-resistant material, it can be placed inside or outside your home. Height: 4 Ft., Width: 12 In., Depth: 12 In., Color: , Pot Size: H: 5 In. W: 6.5 In. D: 6.5 In.